Breaking away from our routine of traveling to national parks in the United States, we decided to journey overseas with a noted tour company to see a part of the world in which we have been interested for a long time. So off it was to Portugal and Spain. We arrived in Lisbon relatively early in the day. After we checked in at our hotel, we were anxious to get out and about to visit some of the sights we researched. 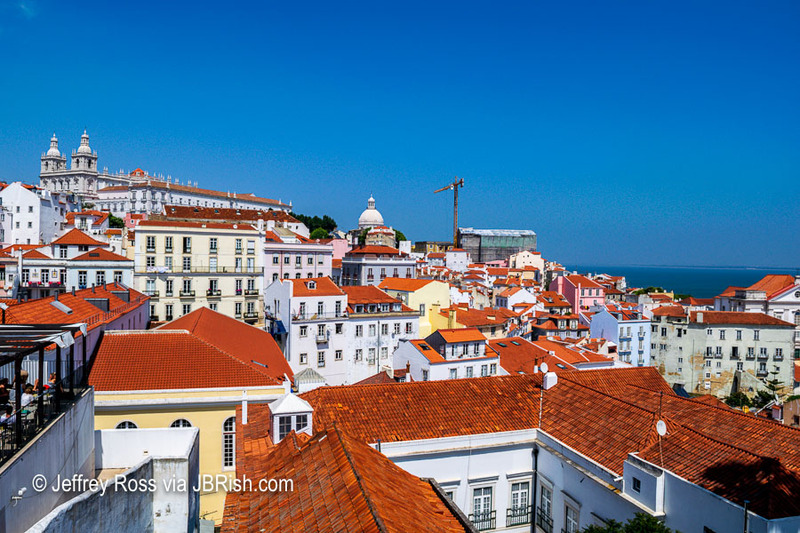 High on the list was the Alfama district in Lisbon. 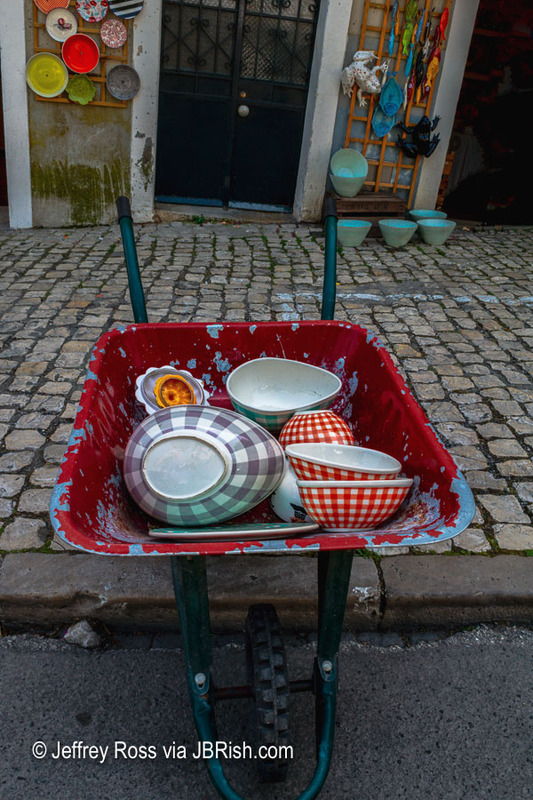 One of Alfama’s distinctions is that it is the oldest neighborhood in Lisbon. 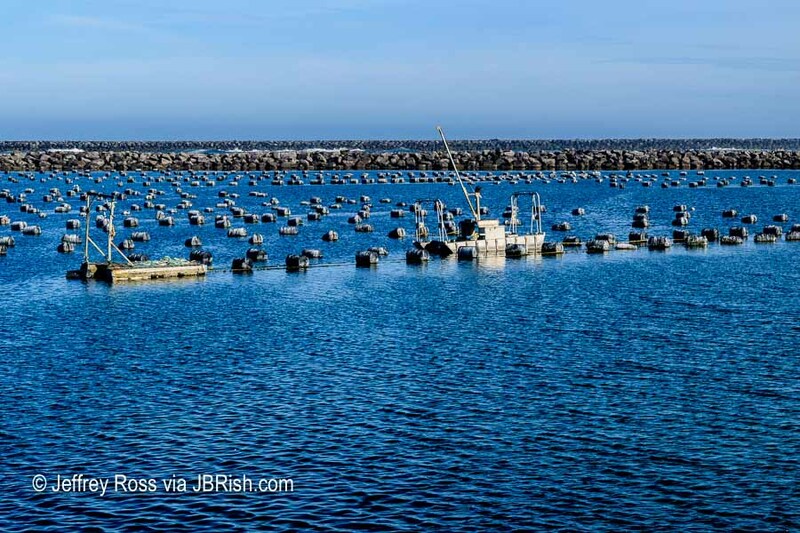 It is located along the Tejo river and is very picturesque. The concierge at the hotel explained that we needed to take a taxi to the tram stop and then take the number 28 to Alfama. 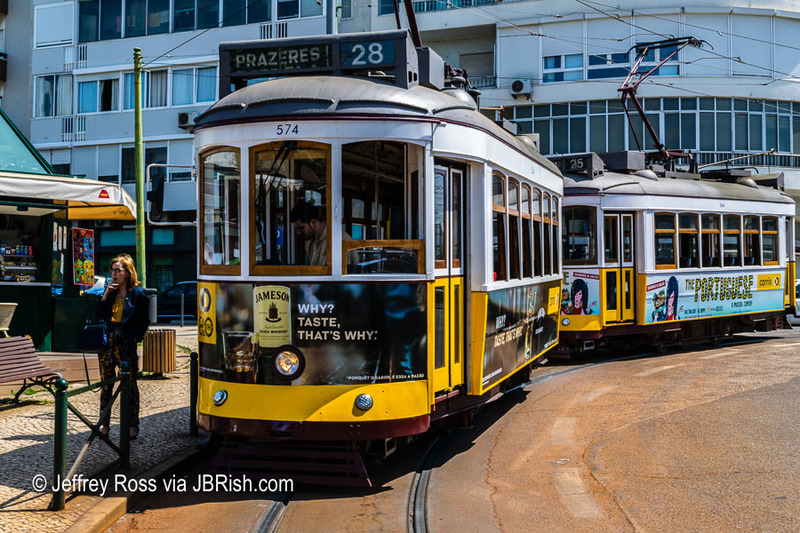 The #28 tram’s route traverses the city’s center thus making it a very busy mode of transportation as tourists use this to arrive at many of Lisbon’s popular attractions. It is less expensive than a tour bus, but there is no guide to point out the sights. We had to be careful as there were two different #28 trams. We determined we needed the one with the destination noted as Prazeres. This popular tram usually operates from 7AM until 11PM daily. Check out the current schedules to be sure. NOTE – Pickpockets often frequent this tram so be careful and keep your valuables close. We had no problems at all (besides the usual language barrier). Little did we understand that the tram was going to drop us off quite a distance from the main section of Alfama and that we also needed to board a small van to take us to Alfama’s central location; no extra charge. Streets are so narrow in places that cars cannot navigate them. Bicycles and smaller motorized transports are plentiful on these narrow side streets. As we were walking to board the jitney, we passed a trash can that was quite unique. 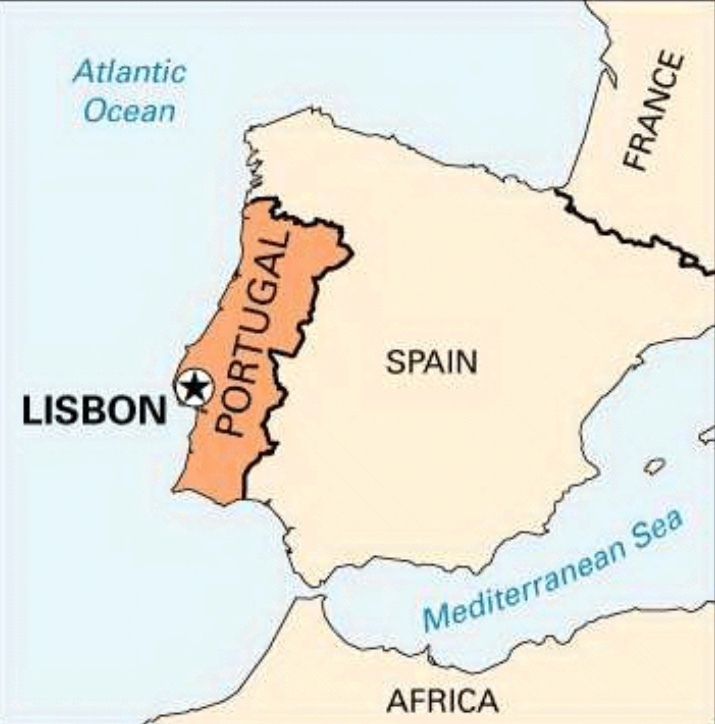 We didn’t realize that this was customary in Portugal and Spain. 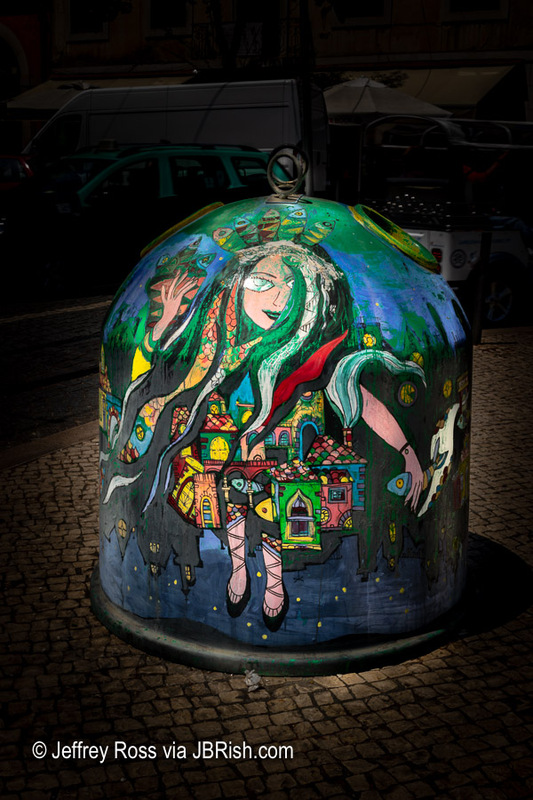 Trash/recycle receptacles are sometimes painted and serve as a work of contemporary art. The city sponsors some to the container art. Apparently a number of other European cities have adopted this colorful method of camouflaging these streetside bins. We managed to find our way to the small van and disembarked near the Miradouro das Portas do Sol (Viewpoint of the Doors of the Sun) which is a large terraced area with an elevated point of view looking over Alfama. The first thing visitors are going to notice is the famous red roofs. This is Alfama’s trademark! In the picture above, the river is barely visible, but some of the prominent buildings can be clearly seen. The large building in the upper left (with the two towers) is the Church or Monastery of São Vicente de Fora which Wikipedia translates as “Monastery of St. Vincent .” Just off to the the right of the Monastery is the dome of the National Pantheon. 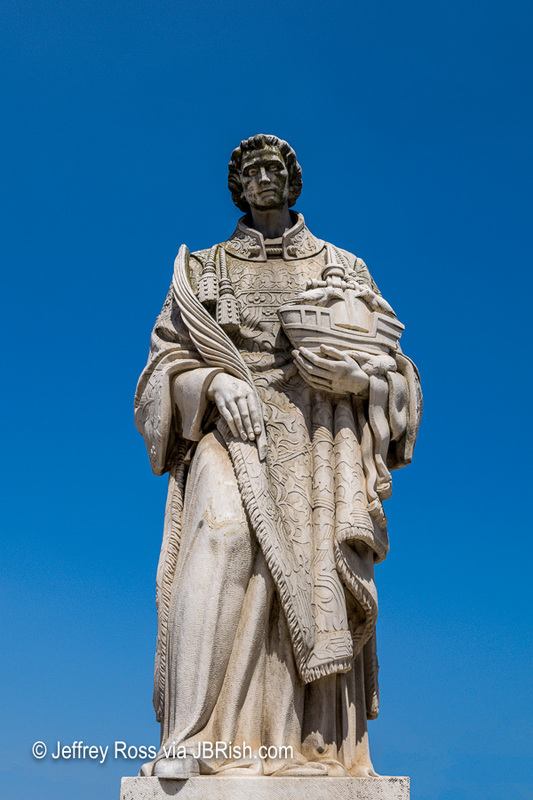 Saint Vincent is Lisbon’s patron saint and a statue to honor him stands as a sentinel at the Portas del Sol close to where most visitors will arrive at one point or another during their explorations. There are several vendors and street merchants at this location trying to capitalize on the crowds that often gather in this area. 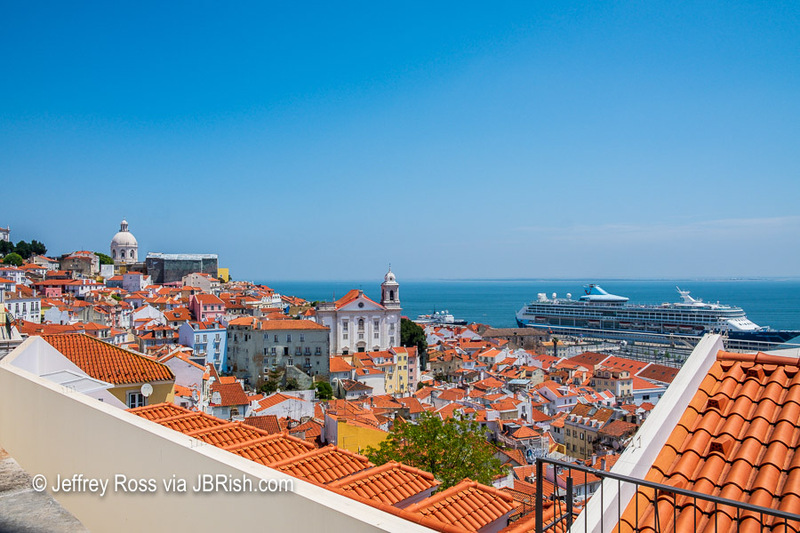 Here is another photograph of Alfama taken from the Miradouro de Santa Luzia which is another great viewing area. The Tejo river is located along the horizon. More central with a single tower visible is the iglesia de Santo Estevao (Church of St. Stephen). 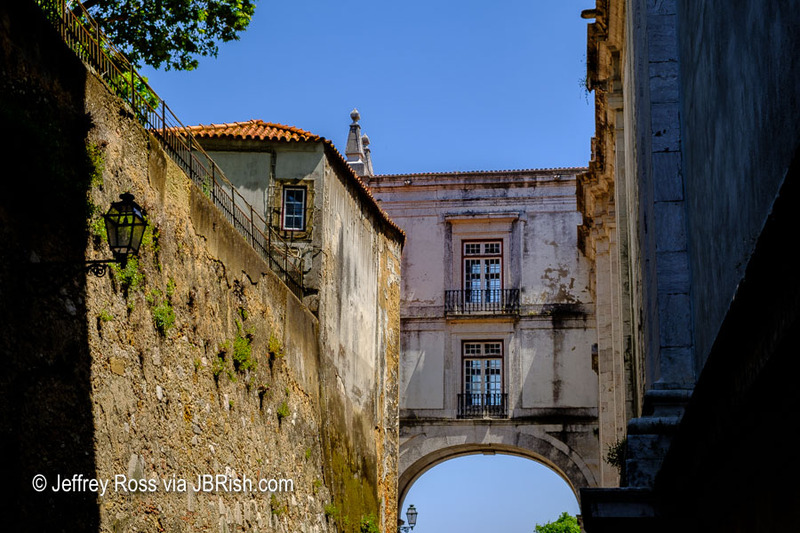 As we began to make our way through the old streets of Alfama on the way to the Thieve’s Market, we passed by ancient structures. Here is a crossover near the Campo de Santa Clara (market square). The Thieves Market is similar to flea markets around the world. 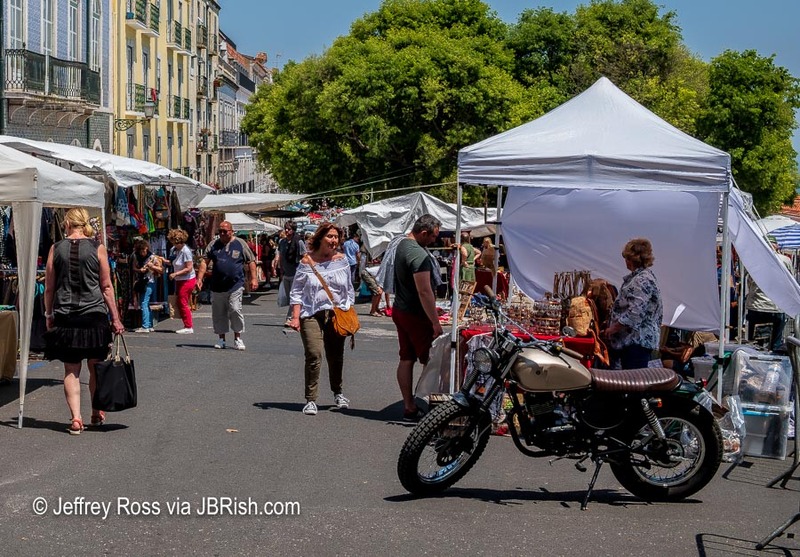 It is only open on Tuesday and Saturdays in the square near the Panteão Nacional and São Vicente de Fora dating back to the late 1880’s. There was a large variety of goods for sale including books, crafts and other typical flea market wares. Read more about our Alfama excursions HERE! It was an unusual decision for us, but we decided to take a trip to Portugal and Spain this spring. Usually we enjoy hiking the national parks and beautiful areas of the United States while our knees and joints can still take to the hills and dales America the beautiful has to offer. 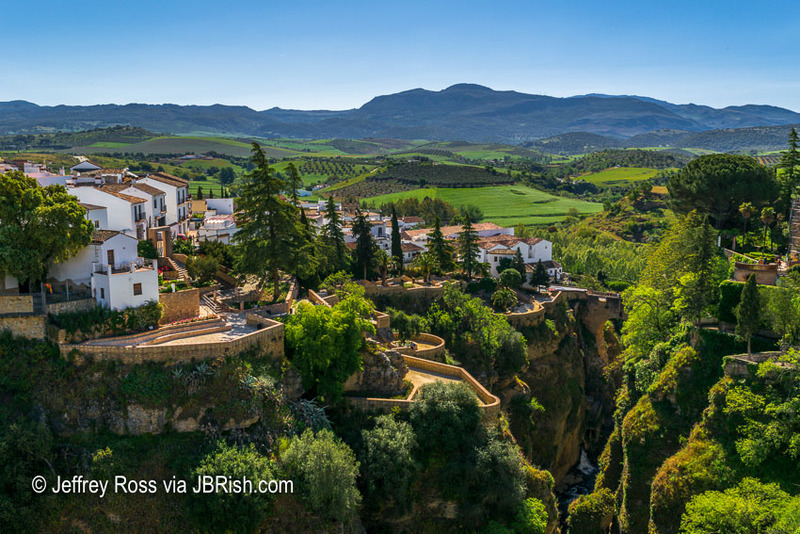 One of our favorite stops on the tour was Puento Nuevo in the town of Ronda Spain. My wife and I often remark at the historic nature of towns in Europe which are very old compared to those in the United States. We tend to think of something as being old if it was founded two hundred years ago, but in Europe we are often talking about multiples of that or even thousands of years. Ronda was first settled in the sixth century B.C. That is old! The photograph above is one of my favorite shots from our trip. It was taken from the Puente Nuevo bridge which is the largest of a number of bridges spanning the gorge of the Guadalevín River that meanders through Ronda. I was hoping to capture the beauty and uniqueness of this spot and I think I managed to do so fairly well. Our maps and notes were showing the wear and tear of daily folding, unfolding and occasional markings incurred through our journey. Indeed our coastal exploration of Oregon was nearing the end. 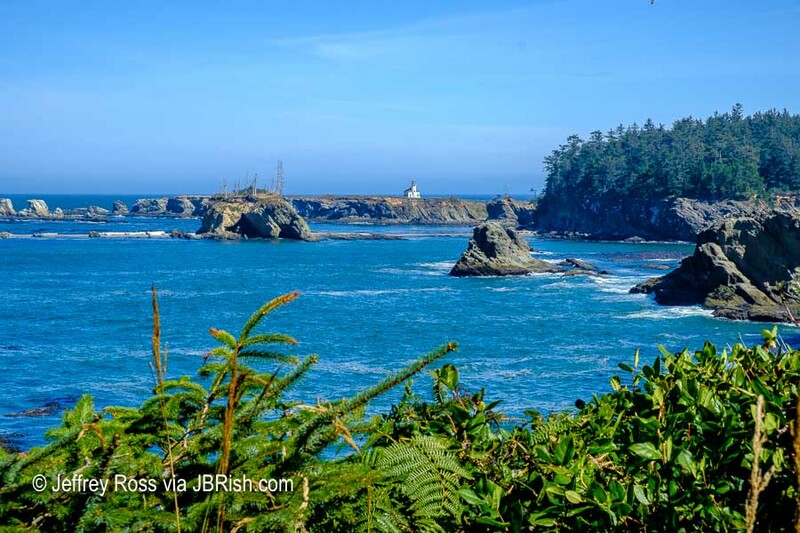 One of the last points of interest we highlighted at the southern leg of our trip was the marine viewing area near Cape Arago State Park with views of Shell Island and Simpson Reef. 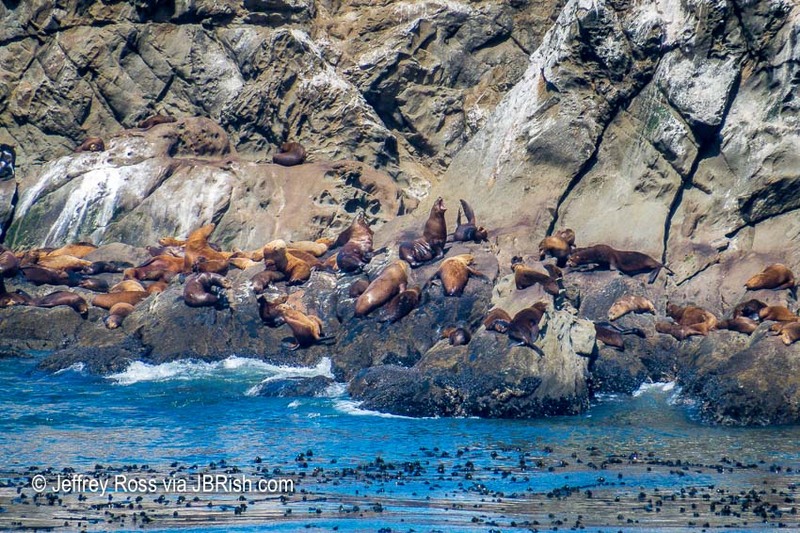 We were told by locals that we would be able to view wildlife at this viewpoint and a closer look revealed colonies of seals and sea lions on nearby Shell Island. The water near Simpson Reef was a bit more shallow and appeared to be a tropical color. Read more about Simpson’s Reef and Shell Island via this brochure. 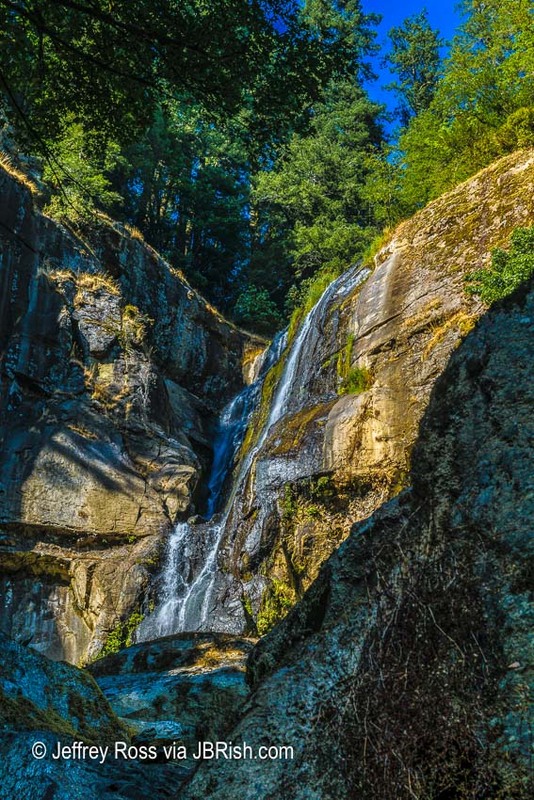 Our day began to take on a theme of land and sea as we were motivated to hike and explore the Golden and Silver Falls State Natural Area farther inland. With maps and cell phone access, we figured it should not be hard to find. There were some quirky twists and turns which led us temporarily astray, but perseverance and a trip down a bumpy road that was hard packed led us to our desired destination; the parking area near the trailhead to the falls. We chatted a bit with a couple familiar with the hikes and gained some advice about which trails to consider. 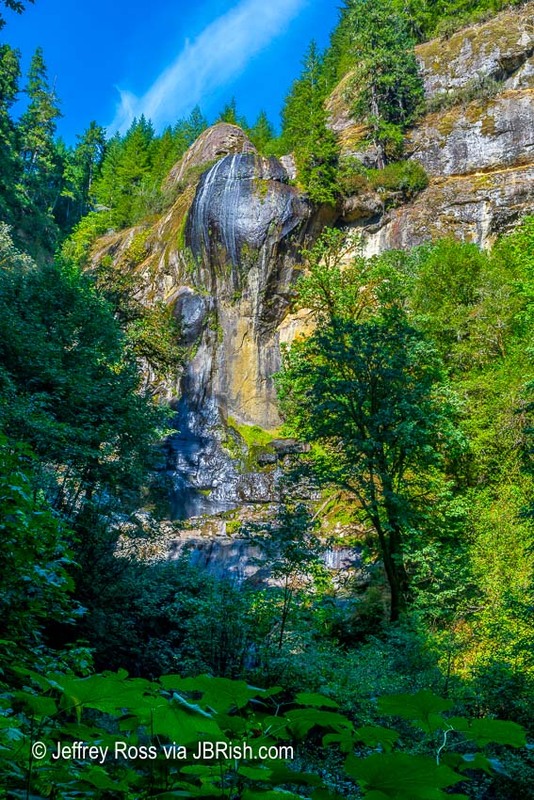 We thought that the view of the Golden Falls would be better if we headed there first to capture the best light. It was after 3PM and the sun was beginning to cast shade on the gorge. The flow of water was not dramatic, but steady and picture-worthy. 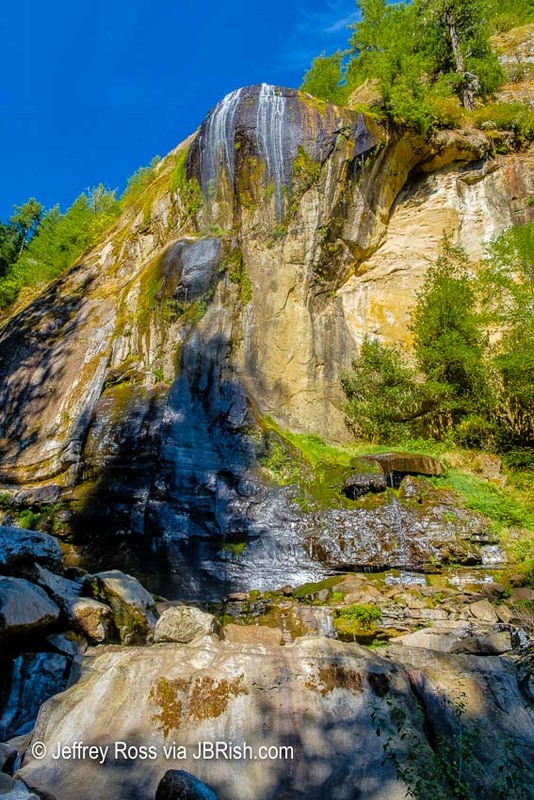 My assumption is that the yellowish color of the rocks along with the tones cast by the sun inspired the name of the Golden Falls. Our last adventure this day was the hike to the Sliver Falls. This proved less dramatic than the Golden Falls, but we wanted to complete the circuit and appreciated nature’s offerings along the way. This was a full day so we were glad to find our lodging for the evening as we prepared for our long drive inland to our final destination; Crater Lake National Park. 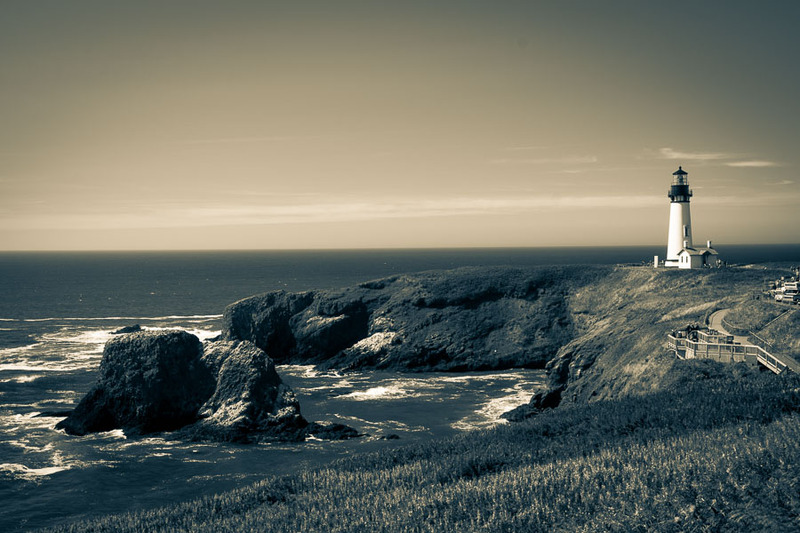 As anticipated when traveling along a nation’s coastline, one is likely to find a number of lighthouses. 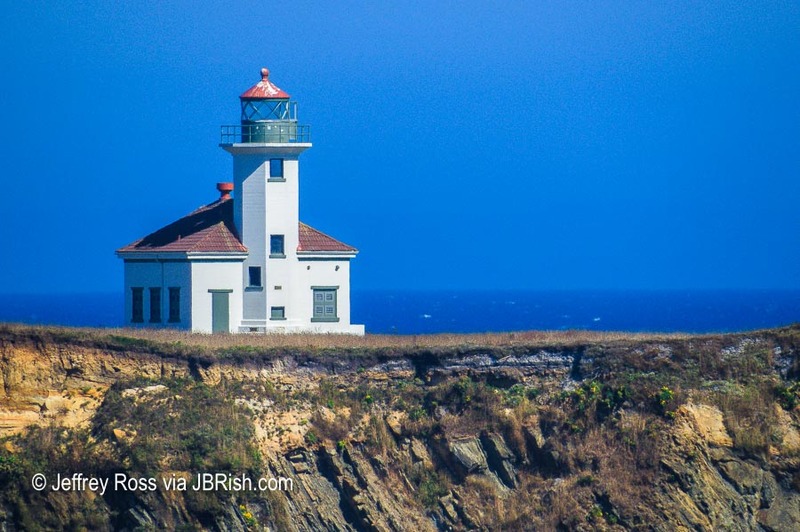 Although technology has rendered them less important than in the past, the lure of the sea and the mystique that accompanies them gives lighthouses a certain panache. 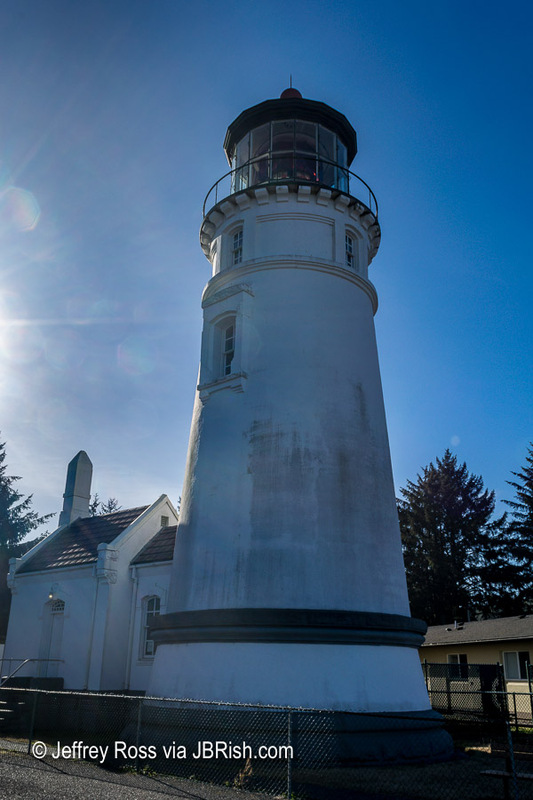 I am as much of a sucker for this type of thing as the next person and was therefore anxious to see the lighthouse at Umpqua Lighthouse State Park. it was not as picturesque or architecturally engaging as others we had seen. The Umpqua Lighthouse State Park had much more to offer than the lighthouse as we pulled into one of the main parking lots near the beach and put on our explorer’s garb. 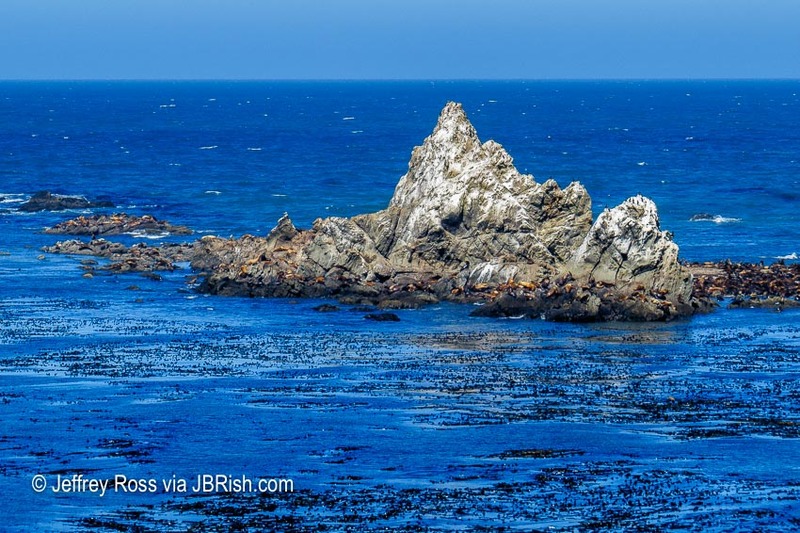 I have always liked beach combing because of some of the treasures Davy Jones tosses our way. As we walked along, we appreciated that we were not the only living creatures on the beach. 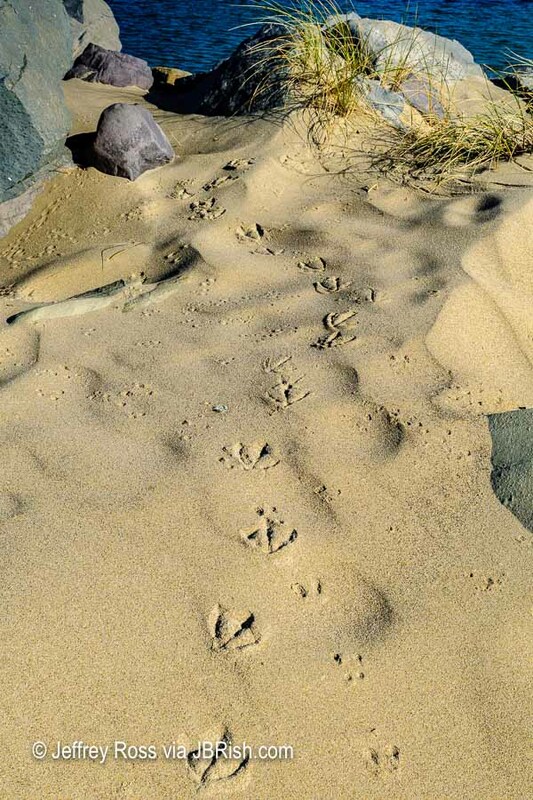 This set of bird tracks went zig-zaging up the rocks toward the water creating an interesting pattern. With much to do this day, we did not linger before heading farther down the road. Sunset Bay State Park was a worthy stop. The tide was low and the colors of the water, surrounding rocks and trees were picture-pretty. 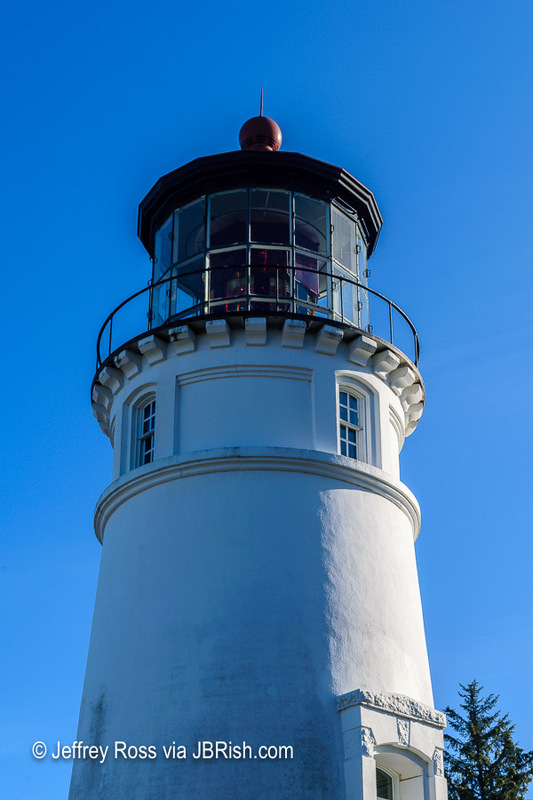 We read about yet another lighhouse at Cape Arago near Charleston and were once again tempted to stop and capture some photographs. These were all from a distance as we could not get close to the building. This was a beautiful day. The sky was blue with wispy clouds and a soft breeze. After a number of days of mist and rain, the sun was most welcome. 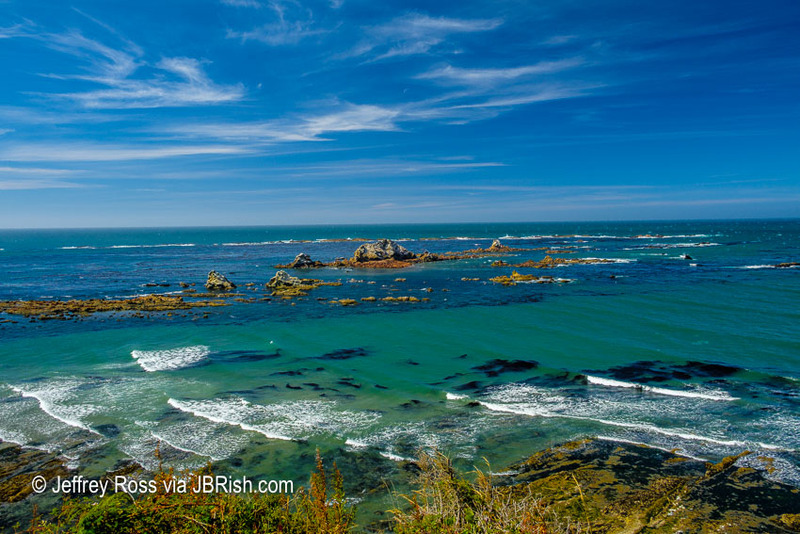 The seaside offered wonderful views of the Pacific Ocean. 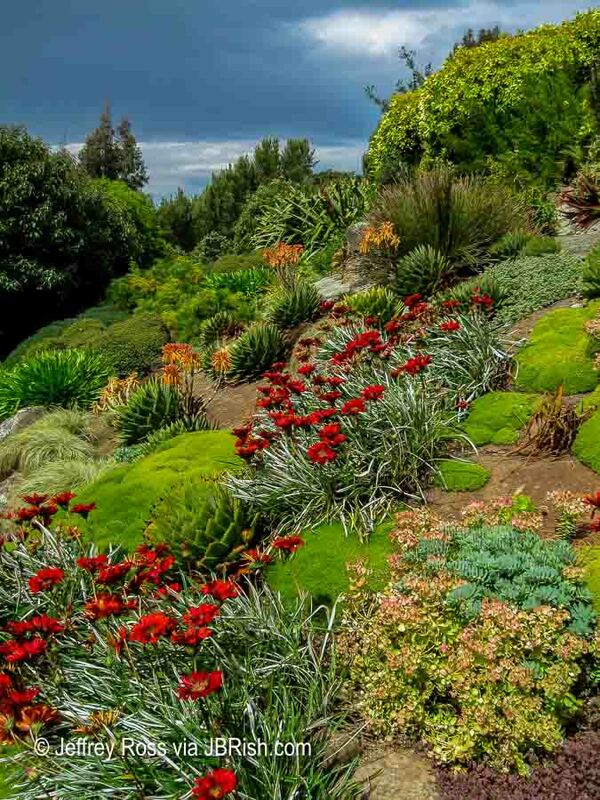 Anyone who spends a bit of time reading posts on JBRish.com, knows that I like gardening and I enjoy flowers. 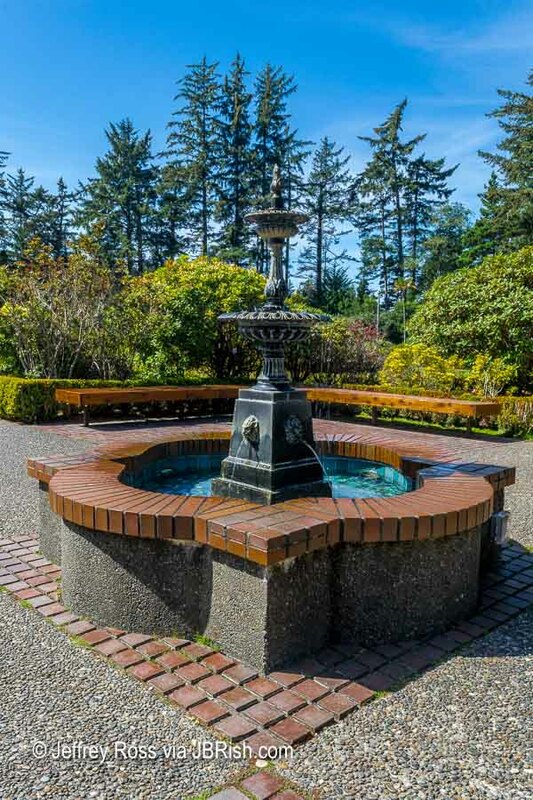 If you also appreciate plants, gardens and beautifully arranged formal garden settings, I would encourage you to stop and spend time at Shore Acres State Park garden near Coos Bay, OR. 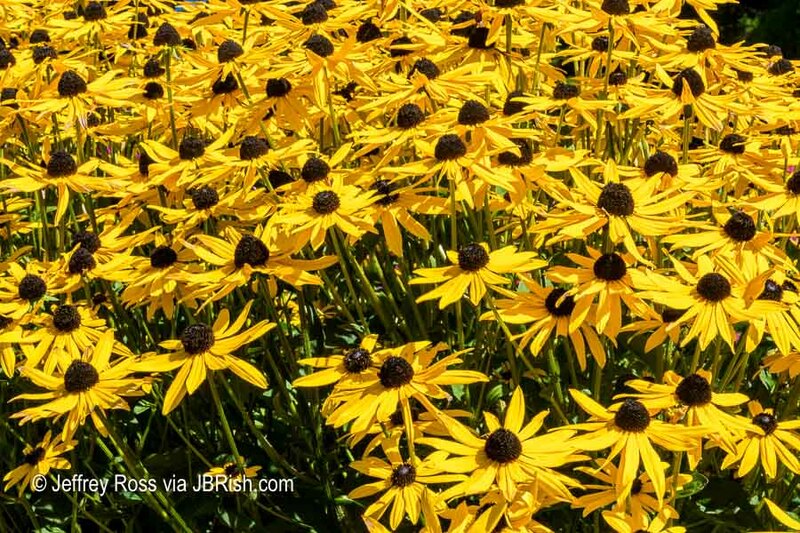 This display of Rudbeckias, which we grew in New Jersey, was thick and dazzling. 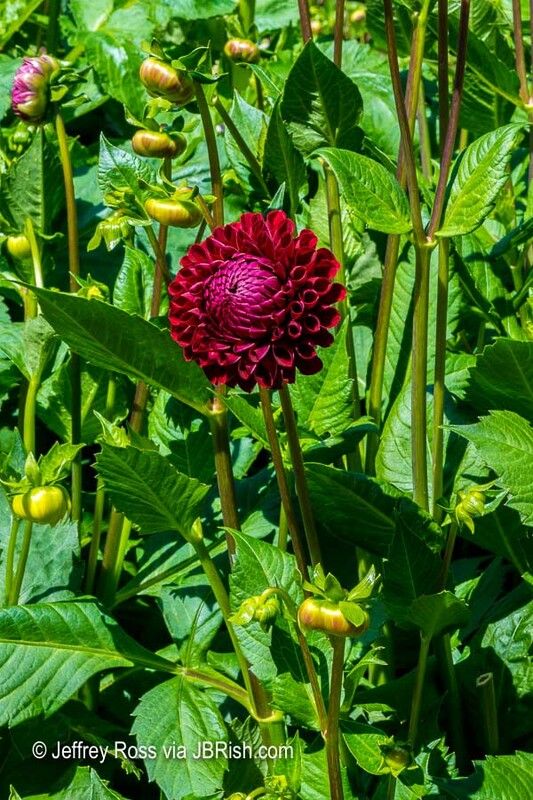 Dahlias have always been one of my favorite flowers because of the intricate petal patterns and nearly unlimited variety in size, color and shape. 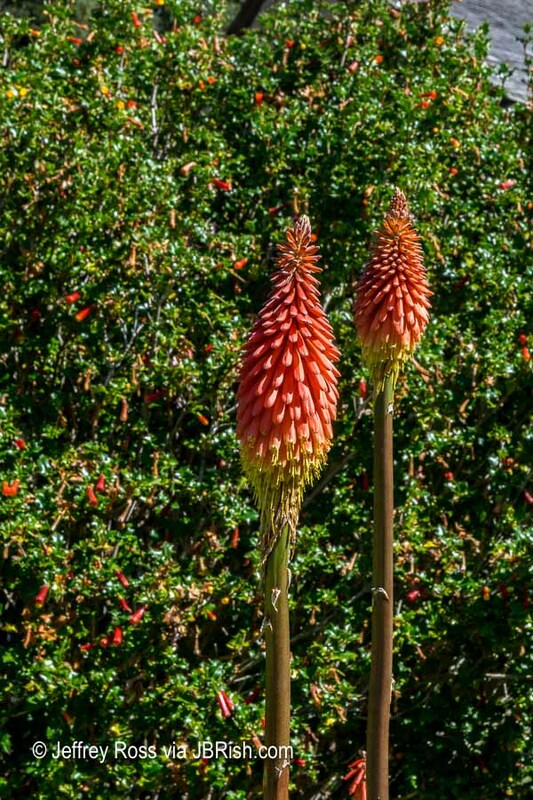 The Hot Poker Plant (Tritoma) was one I have never grown, but these specimens were very colorful placed along the nearby hedge. 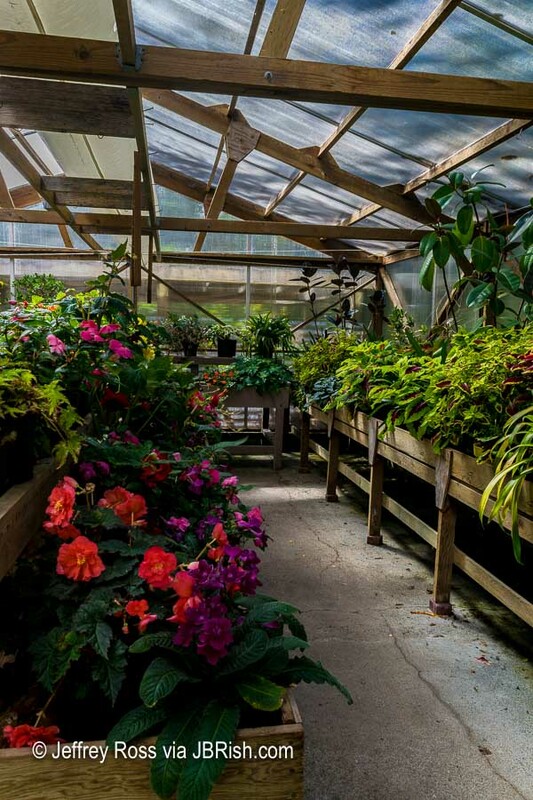 There were a few greenhouses that had open doors and we took advantage of the “invite” and stepped inside. 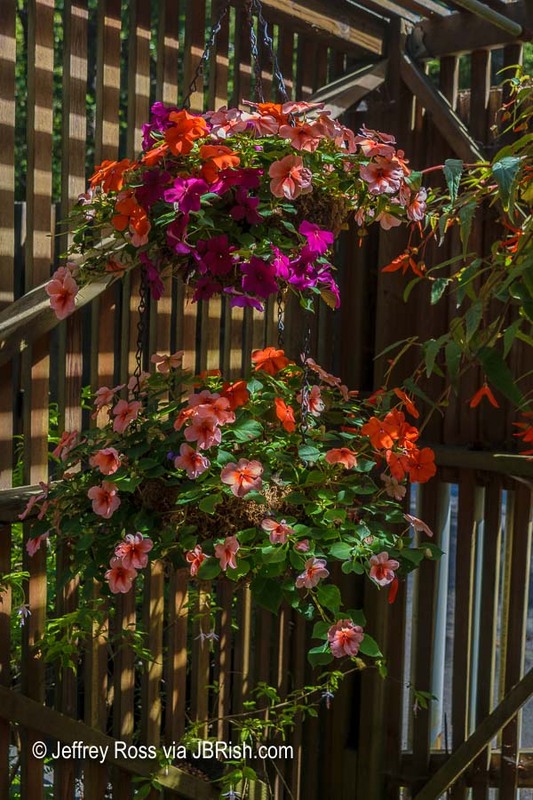 There were baskets of Impatiens, Angel Wing Begonias, Tuberous Begonias, Streptocarpus, Gloxinias and more. Visitors couldn’t ask for a more exquisite setting. 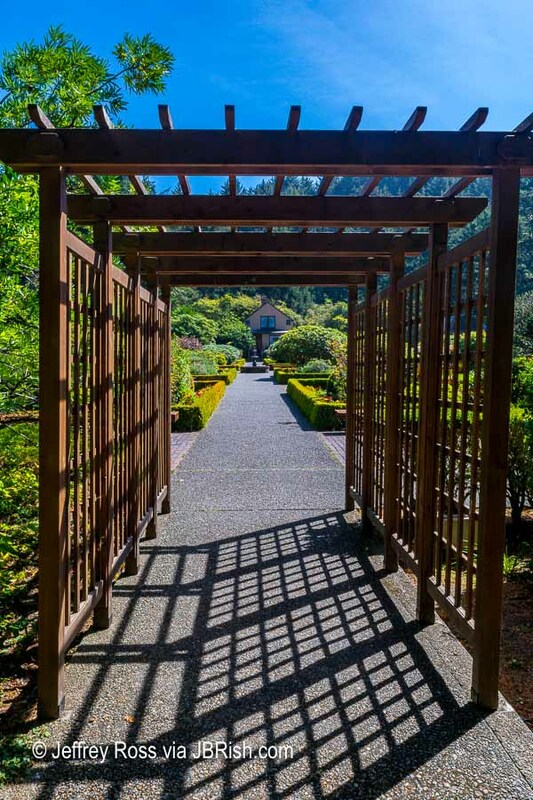 There were an abundance of plants in a manicured and beautifully hardscaped botanical venue. When we visited New Zealand in 2009, the only camera I took with me was a very small point-and-shoot Canon AS590 IS, which at that time was considered fairly good for its class. Even with this small-ish 8 megapixel count, I was able to capture some amazing pictures. The photograph below was taken at Larnach Castle in Dunedin, New Zealand. The sky was overcast and the colors were vibrant in themselves. This photo was edited a bit in Lightroom, but trust me when I say that this was a striking picture before the editing process. I encourage everyone to record their adventures as large or small as they may be with whatever camera or smart phone they have with them. The images will be a treasure to review and appreciate over time. Interestingly enough, there were a number of plants in this garden that we grow in our Sonoran Desert area. 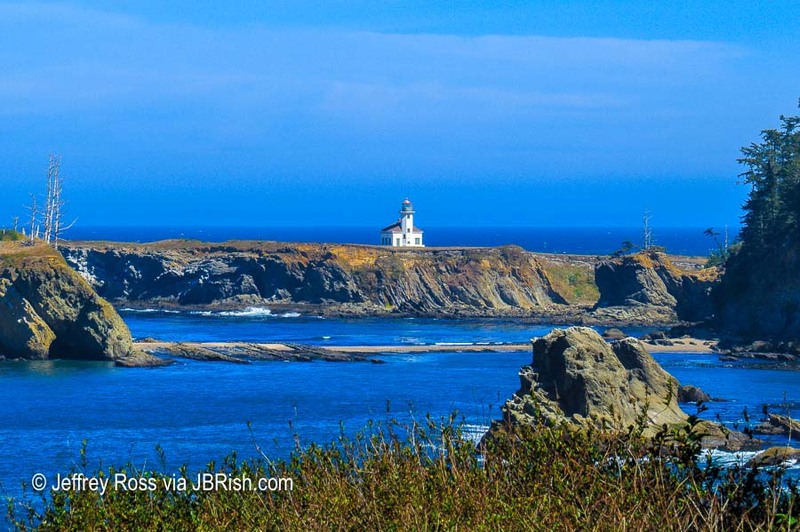 While hiking down the coast of Oregon, we enjoyed visiting a number of lighthouses along the picturesque coastline. A challenge photographers face when they arrive at such an area is that many other people want to enjoy the same view and that is a good thing! The issue is how to capture a picture with as few distracting elements as possible. 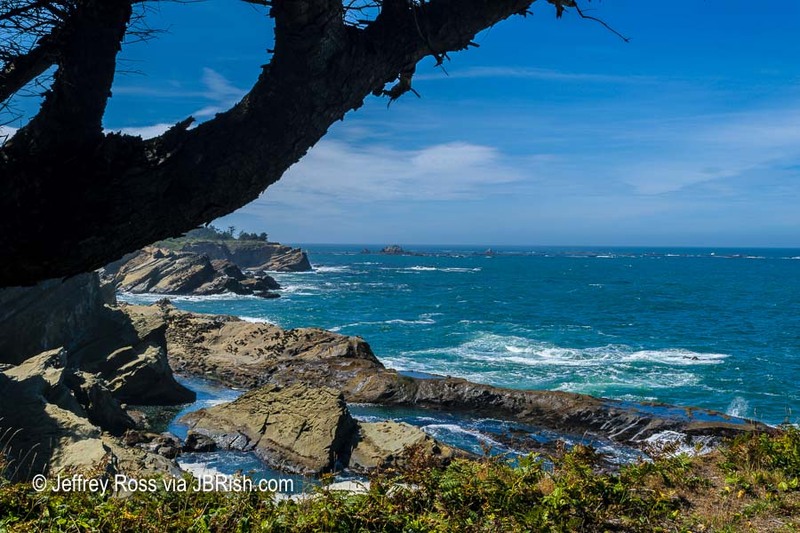 There have been several times when I have been at a prominent place in a national park where the scene was spectacular, but in the field of view there was a couple having lunch or a snack wearing bright orange or luminescent green garments. Obviously this can be addressed by waiting for the people to move or fix it in post processing. In the picture below, there were a number of people, cars, RVs, etc. (middle right) that would prove problematic for the composition for reasons mentioned above. Rather than work on each piece in Photoshop, I decided to use a toned, black and white image (duotone) to maintain the focus on the distant lighthouse. I hope it works as I thought it would! The southwest is truly a spectacular part of the United States. That is not to say other states, sections, etc. do not have beauiful areas as well, but the southwest has been blessed with an abundance natural wonders. I am glad to report that we have been to all of the above and we yearn to return to several of them to see more of what they have to offer. We hiked Zion two times and want to return at least once more. For those who love nature, hiking, etc. it is hard to overestimate the amount of wonder that can be found in all of the parks listed above. 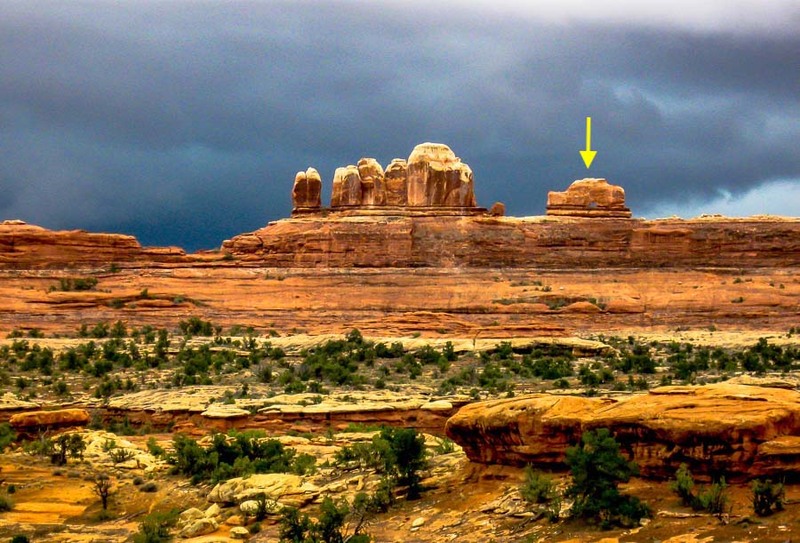 As a side trip to visiting Arches National Park, we took a day to go to Canyonlands National Park’s Needles District. The day was stormy with periods of rain, but as long as it is safe, we hike rain or shine. One site we saw was the Wooden Shoe Arch. I only had my 8 MP Canon point-and-shoot, but as they say: “The best camera is the one you have with you.” I took the picture below and I think it captures the beauty of the area. You may have to look carefully to see the “shoe.” It is the formation in the distance on the right. The heel and front of the shoe are separated by a space. The cloudy day makes it hard to discern so I put an arrow above the shoe in the picture below. 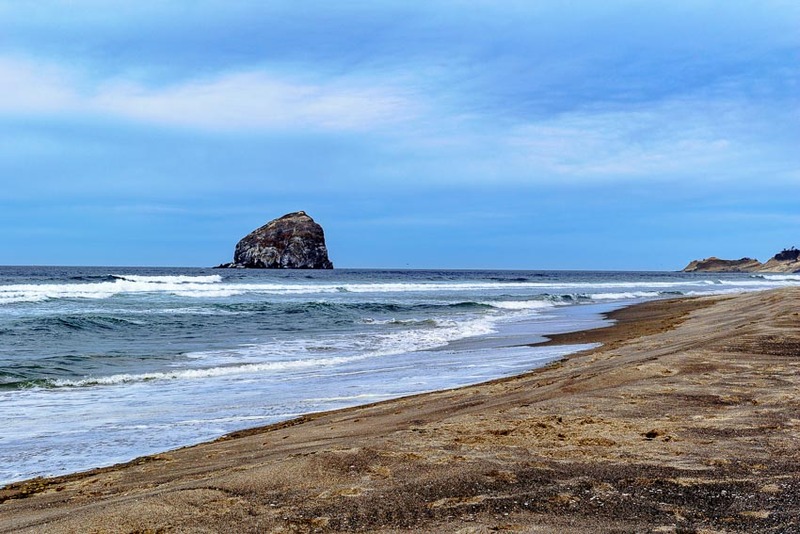 After leaving Cape Lookout State Park, we were eager to see more of the beautiful and very different (for us) Oregon coast. 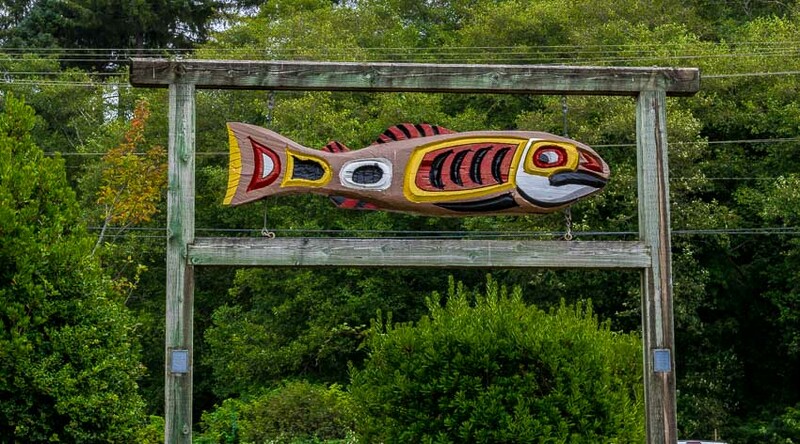 Our next stop was Pacific City and environs. We realized very soon into our adventures that every city, town, hamlet, etc. 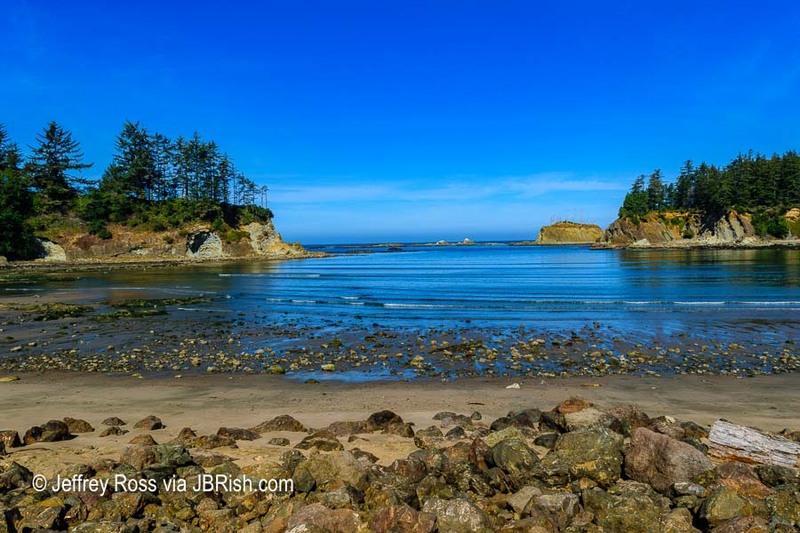 is very proud of their section of the Oregon coast with their variety of natural rock formations and distinct features. This is why we encountered two very different Haystack Rocks. 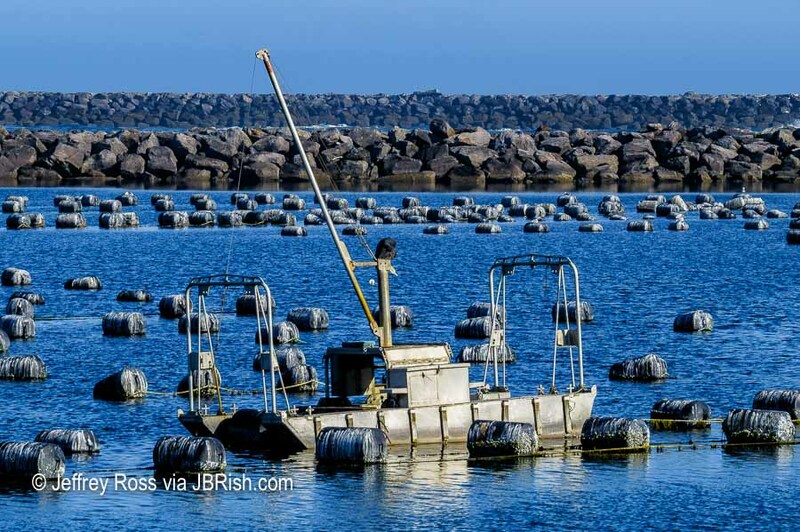 They both resemble haystacks, but are very different in appearance. 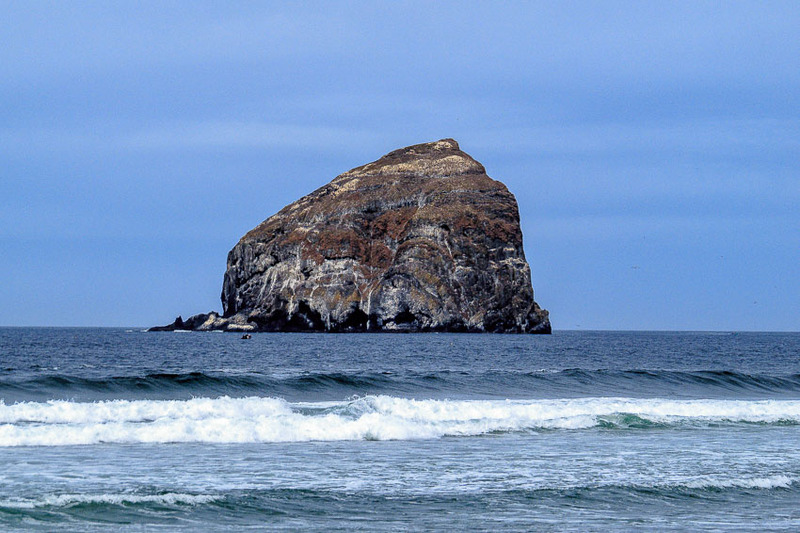 Here is the second Haystack that we encountered in Pacific City. It is hard to appreciate at a distance so here is a closer view. 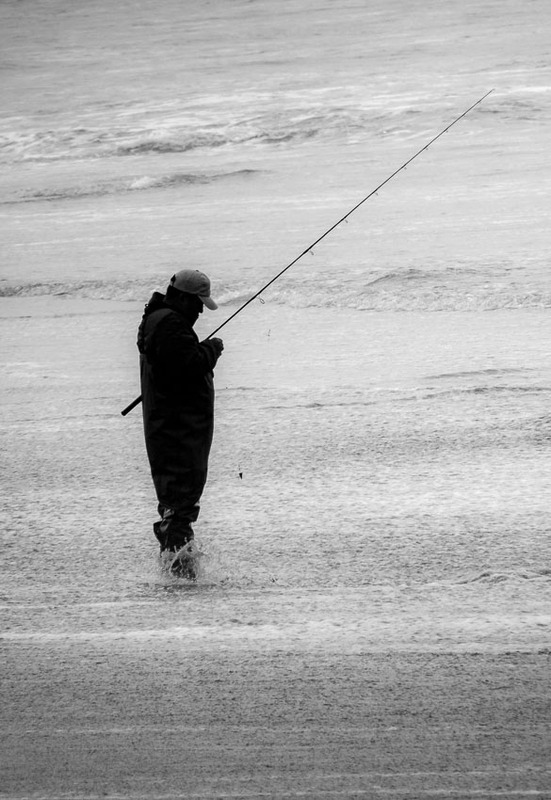 The relatively nice day brought many people to the shore for a variety of activities including surf casting. After a stroll along the beach, we decided to take advantage of whatever sunshine we had so we headed for the Nestucca Bay National Wildlife Refuge. We are fond of preserves and refuges and the descriptions we read were enticing. We realized that this area was being revitalized and was very nicely presented. Unfortunately, this was probably not the best time of the year to appreciate the refuge as most wildflowers were dead or waning. 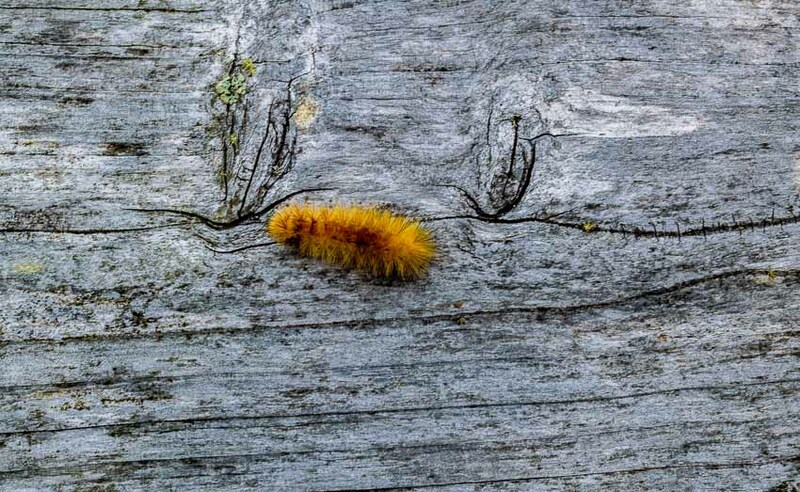 I guess the wooly bear caterpillar should have given us a clue. Nevertheless, we embarked on the walk up the main path. 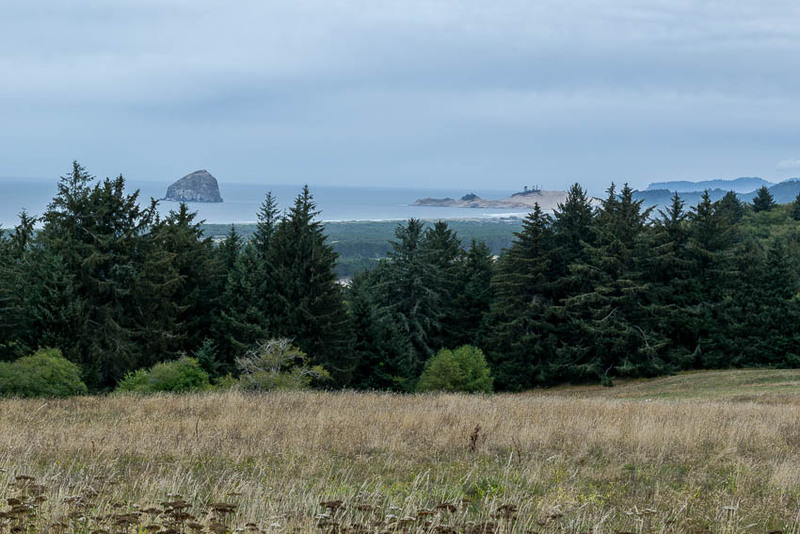 Here is a view of Haystack Rock from one of the highest points in the park. We also appreciated the “fun” side shown by the custodians of the refuge. 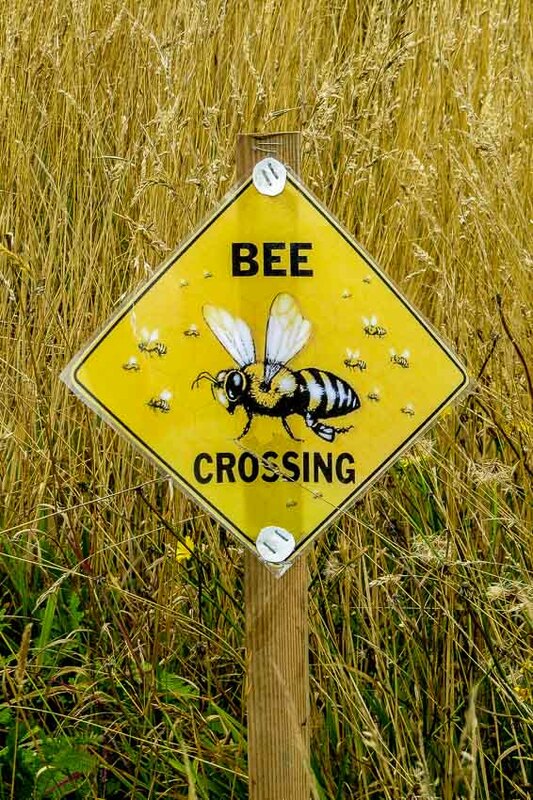 Bee crossing sign – fun! With no animals, not very many flowers to see, the sky becoming overcast and cooler temperatures developing, we left the refuge. Once again we decided to head on down the road to see another one of the touted sites nearby; Proposal Rock. There was a large parking area near the beach access with a unique and colorful wooden sign. 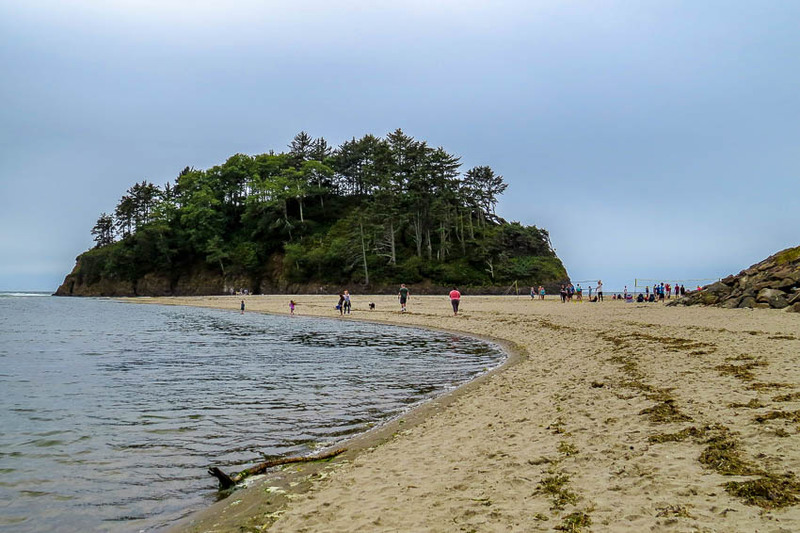 A short walk toward the back of a nearby hotel, led us to the beach where Proposal Rock is located. There was an active volleyball game being played as you can see in the area between the gap toward the right of the photograph. 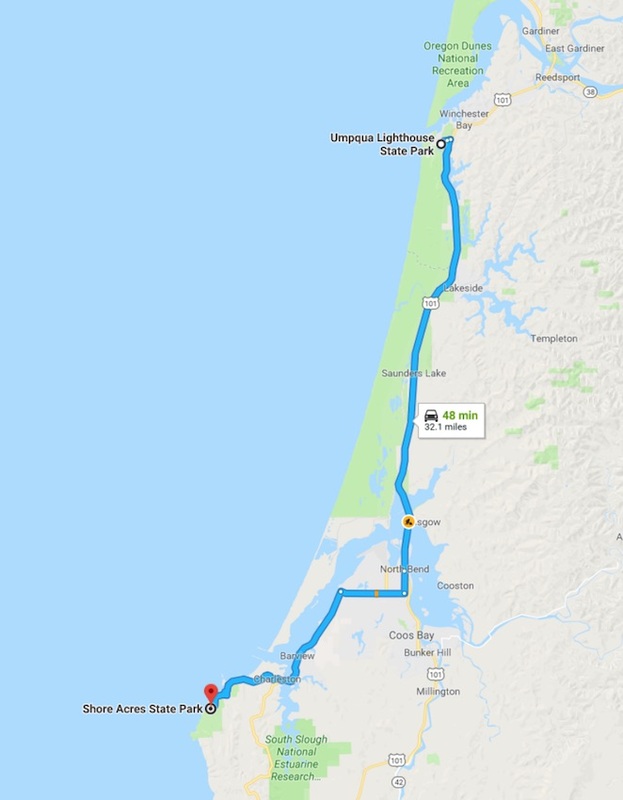 We had one more stop earmarked for this day so we headed back to our car and reviewed the map for the best route toward Lincoln City. Once in town, and after securing our room for the evening, we headed for Roads End State Park. 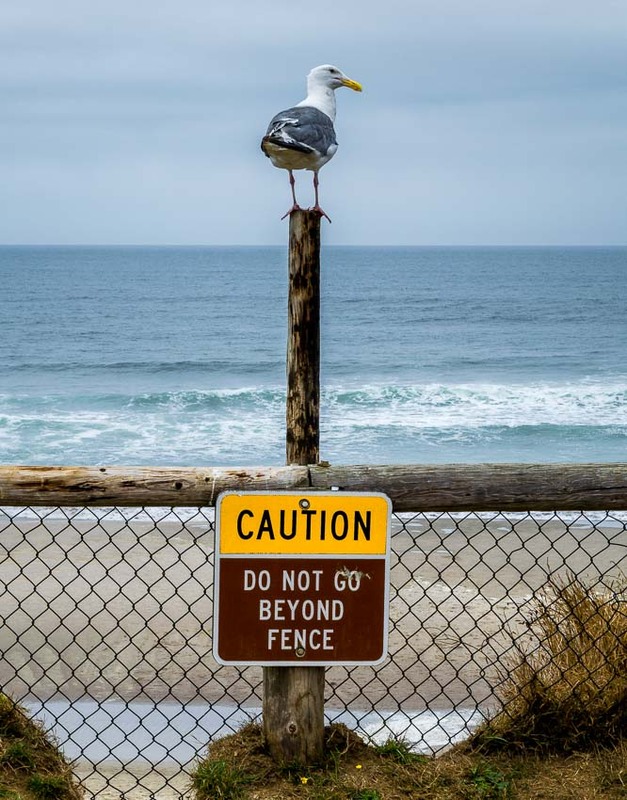 One of the area “residents” seemed to be standing watch over the parking lot inspecting new arrivals while making sure to heed the sign. Although the day was not very sunny, this beach was abuzz. There were college groups playing a variety of sports which we stopped to watch at various points. Many of the activities were new to us. We proceeded with our customary routine of exploring by walking up and down the beach looking with interest at the various items we found in the sand and admiring energetic pups running through the surf. 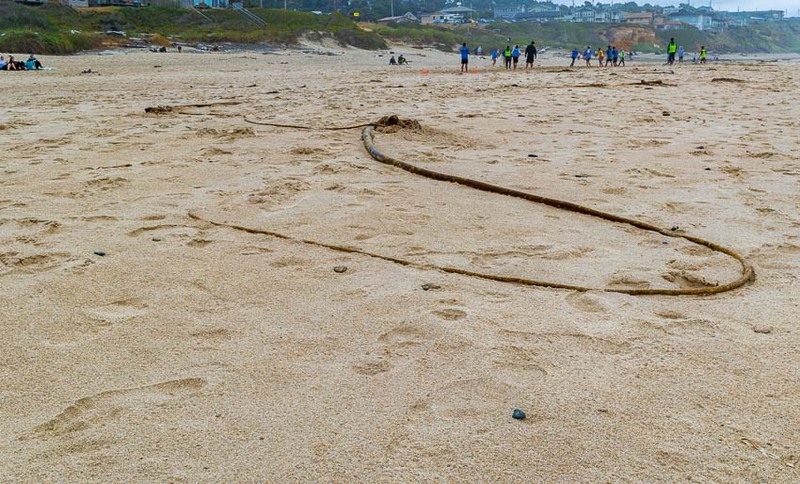 This long rope-like piece of vegetation (below) is Bull Whip Kelp. These plants were very long perhaps twenty feet or more. It was amazing to see how thick and firm they were and how many pieces were strewn across the sand. Nature has an interesting way of offering gifts to those who are observant. 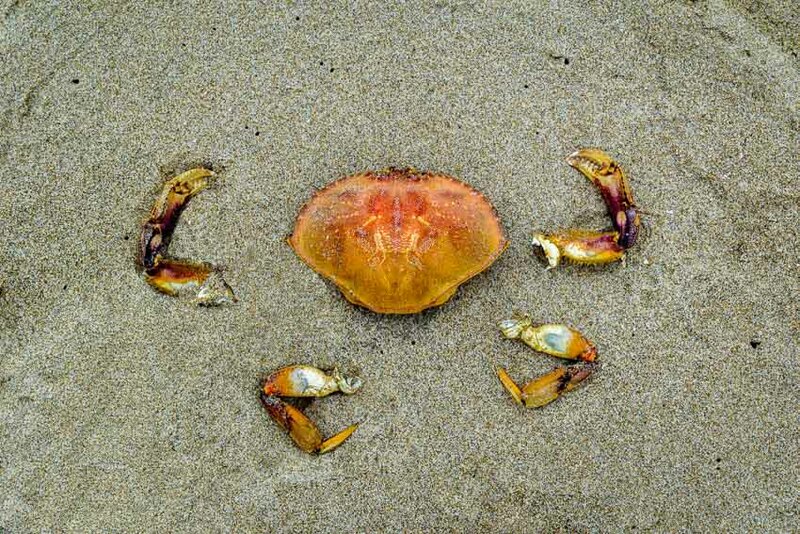 Whle walking along the beach, we discovered the pieces of a Dungeness crab. Although the crab was very dead and well-eaten, all the major parts where present. I only had to move them slightly to arrange them in their relative natural order. 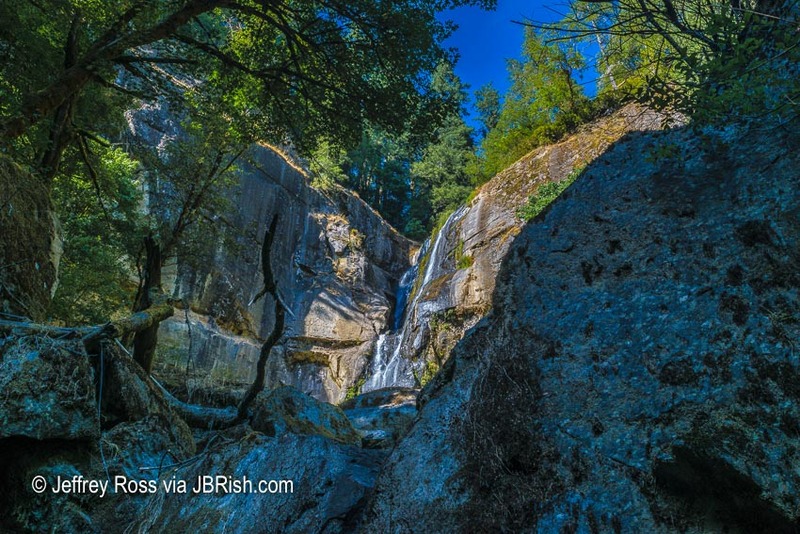 JBRish readers know that one thing we enjoy and write about on this blog is hiking and exploring natural places. We appreciate all forms of wildlife and types of terrain, but the mountains and canyons have a special pull on our adventurous spirit. The Grand Canyon is indeed one of earth’s treasures and it is a shame that mankind has tried to take advantage of its bounty by harvesting natural resources and obliterating some of the pristine beauty. Below is just one photograph I took on our visit to the North Rim. It was taken with a very simple point-and-shoot camera with only 8 megapixels of resolution when most of today’s cameras start at twice that number and many go to three or four times that and beyond. Even with the limited ability of the camera and the photographer, I think you will agree that this is a pretty, colorful picture taken near “the Lodge” at the north rim of the Grand Canyon. I am also sharing the trailer to the movie Dust in the Blood detailing the journey of filmmaker/photographer Pete McBride and writer Kevin Fedark as they try to hike the 750 mile length of the Grand Canyon. Dust in the Blood – Trailer from Pete McBride on Vimeo. In 2016 filmmaker/photographer Pete McBride and writer Kevin Fedarko set out on a 750-mile journey on foot through the entire length of the Grand Canyon. From the outset, the challenge was far more than they bargained for. More people have stood on the moon than have completed a continuous through hike of the Canyon. McBride and Fedarko took a sectional approach, achieving a feat that many adventurers have taken decades to complete. Others have lost their lives trying. But their quest was more than just an endurance test – it was also a way to draw attention to the unprecedented threats facing one of our most revered landscapes. 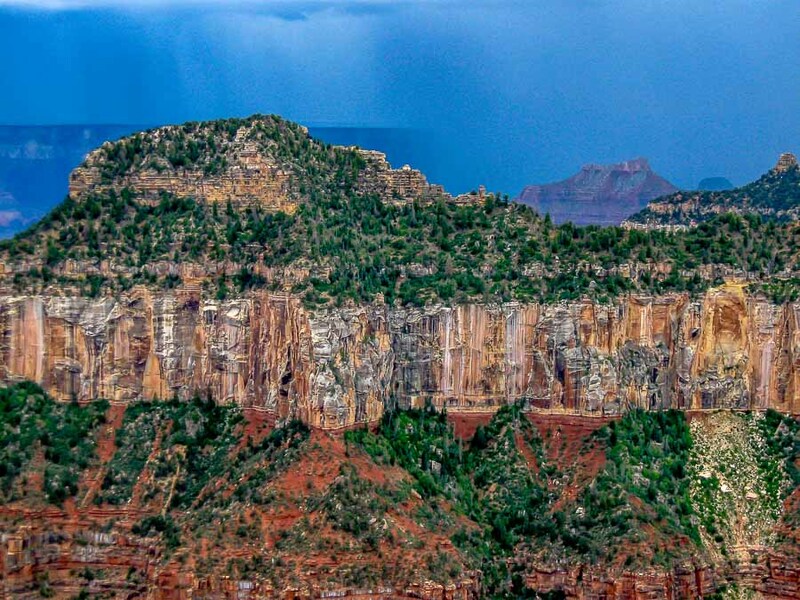 Throughout their passage, McBride and Fedarko encountered an astonishingly diverse and powerful landscape, rich in history, that is now facing perhaps the gravest crisis in the 98-year history of the Grand Canyon National Park. Directed by Pete McBride and produced by the award-winning team at Insignia Films, THE CANYON is a story of extreme physical hardship that stretches the bonds of friendship and a meditation on the timeless beauty of this sacred place. 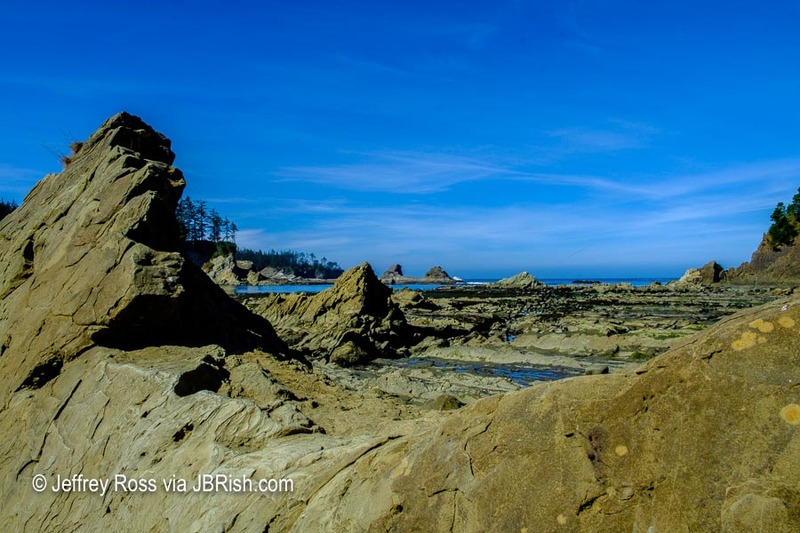 It is an urgent warning about the environmental dangers that are placing one of America’s greatest monuments in peril and a cautionary tale for our complex relationship with the natural world. The majesty of the forest has always had a special place in my heart. I feel a kinship with the plants and trees which are so vital to our ecosystem and therefore our lives. 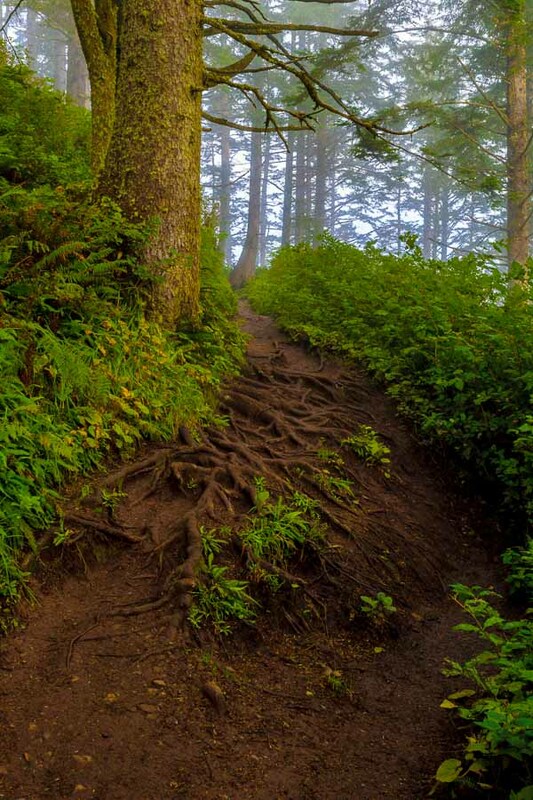 The picture above was taken during our hike along the South Trail of Cape Lookout which is part of Cape Lookout State Park near Tillamook, OR. As you can tell, the mist was clearing, but still hanging in the air. This tree had an intricate web of roots which enhanced its character even if it made footing a bit tricky. I was taken in by the wonderful colors of brown and greens. This was an enchanted setting.